The G1000 Transition can be customized to the pilots level of experience. If the pilot has Garmin 430/530 experience, the transition will be shorter to complete. VirtualPOH.com offers a G1000 online training program that walks you through the operation of the integrated system. 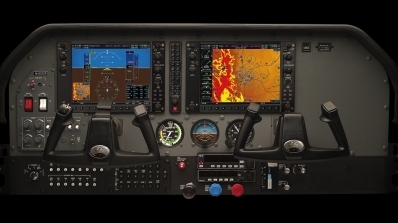 An interactive G1000 demonstrator allows you to operate the system while you learn. Please visit Virtualpoh.com for details. The G1000 integrates all primary flight, engine and sensor data to provide intuitive, at-a-glance situational awareness. Real-time, flight-critical information is presented on two big, colorful 10.4-inch active-matrix LCD displays, bringing new levels of safety and confidence to the Cessna Skyhawk. The G1000 creates the irresistible combination of the future of flight with the world's most-embraced, most-flown aircraft ever. Two displays, a 10-inch Primary Flight Display (PFD) and 10- or 15-inch Multi-Function Display (MFD) with XGA (1024 x 768) resolution, wide viewing angles, and clear sunlight readability. Dual integrated radio modules that provide IFR oceanic-approved GPS; VHF navigation with ILS; and VHF communication with 16-watt transceivers and 8.33-kHz channel spacing — built on the proven platform of the Garmin 400/500 avionics series. Integrated Mode S Transponders with Traffic Information Service (TIS) and optional diversity (Mode-C transponder also available). Integrated solid-state Attitude and Heading Reference Systems (AHRS). Integrated digital air data computers (optional RVSM compatibility). Optional four-color digital weather radar. Optional integrated Class-B Terrain Awareness and Warning System (TAWS) with worldwide terrain and obstacle database.